School Examination Papers – the largest collection of its kind? 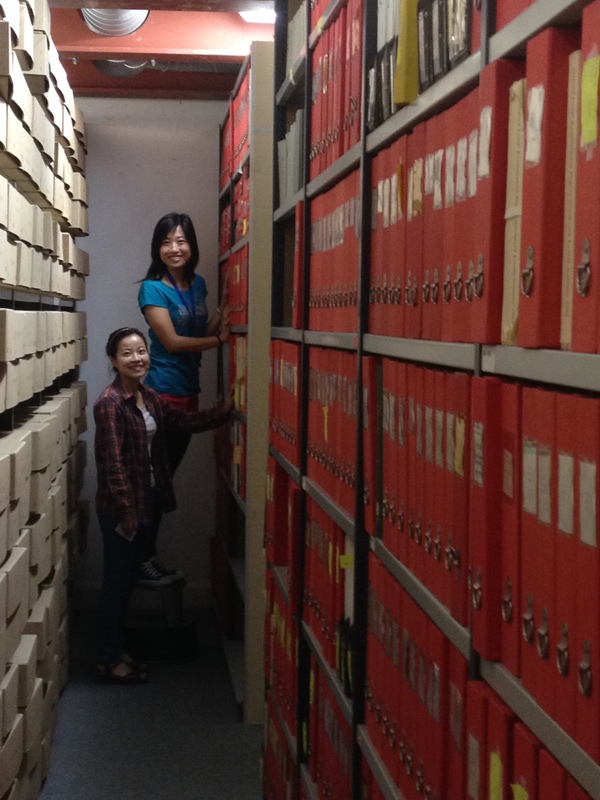 At long last I have had a moment to write about a mammoth summer project undertaken by our wonderful Archives and Collections Assistants (ACAs), Sunninn Yun and Qian Xu (Tracey). Sadly, both Sunninn and Tracey have left us – Sunninn to continue with her PhD studies and teach part-time and Tracey to return to China after completing her Masters degree here at the IOE in order to teach ESL in a school. However, I am still celebrating their achievements. Sunninn and Tracey amalgamated three different exam paper collections: the largest donated by the Department for Children, Schools and Families (DCSF), the original IOE collection which was relatively small and the Leeds University Collection which was donated to the Newsam Library in 2012. The latter were shipped to us in eighty boxes! The ACAs were tasked to create one running sequence of papers arranged alphabetically by exam board – the major examining boards include the AEB (Associated Examining Board), JMB (Joint Matriculation Board), University of London, University of Cambridge, University of Oxford, Oxford and Cambridge, and other regional groups – and in chronological order. The earliest papers date from about 1907 and the latest are from the mid-1990s. It took Sunninn and Tracey just over four months, working a total of ten hours a week, to complete this project. I am full of admiration of the work they have done on this project; it required determination, enthusiasm and commitment – all of which they had plenty of. The outcome is ‘stunning’ – a word I only use to describe library collections, of course! It truly is visually stunning, row after row of gleaming red boxes is a feast for my eyes! It no longer takes me ages to find papers that researchers request and I can easily identify the gaps in the collection because of their arrangement. I no longer have to rummage around looking for a particular paper and then wasting time trying to put them back in some sort of order. So a belated thank you so very much to Sunninn Yun and Tracey Xu. I keep in touch with both of them via Facebook so this is a post I will make sure they see – thanks are always better late than never. Our next task is to re-box these papers in acid-free boxes – and perhaps to digitise sample papers for the different subjects which are represented in the collection – when funding becomes available. More information on our School Examinations Collection can be found on the Special Collections LibGuide at http://libguides.ioe.ac.uk/specialcollections and here. This entry was posted in Library and Archives, Special Collections and tagged exam boards, exam papers, examination papers, school exam papers, special collections. Bookmark the permalink.